From all indications, respite may have come the way of Arik Airlines currently immersed in heavy financial debt burden that is threatening to permanently ground the airline. 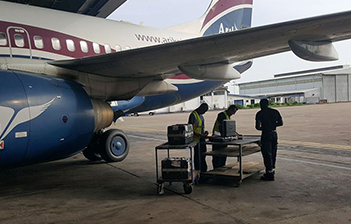 For some time now, the airline, which carries about 55% of the load in the country, has been going through difficult times that are attributable to its bad corporate governance, erratic operational challenges, inability to pay staff salaries and heavy debt burden among other issues, which led to the call for authorities in the country to intervene before Arik goes under like many before it. The move, which clearly underscores government’s decision to instill sanity in the nation’s aviation sector has also prevented a major catastrophe that would among other factors protect, and preserve Arik Airlines as a going concern. The development will afford Arik Airlines, which is the largest local carrier to go back to regular and undisrupted operations, avoid job losses, protect investors and stakeholder funds as well as ensure safety and stability in the already challenged aviation sector. The airline would now be managed by Capt. Roy Ukpebo Ilegbodu, a veretan aviation expert under the receivership of Mr. Oluseye Opasanya, SAN. The Minister who further pledged that the Federal Ministry of Aviation would support the new management of the strategic carrier added that all necessary steps have been taken to ensure that there would be no undue disruption on Arik’s regular business operations or activities of other stakeholders, on account of the recent changes in the leadership and management of Arik Airline. In the same vein, Capt. Ilegbodu, under the receivership of Opasanya, SAN has also assured both staff of the troubled airline and all other stakeholders that his appointment at Arik would among other objectives enhance the value of Arik, improve customer experience, and sustain the safety, reliable and secure operational history of the airline before all those were eroded. As a matter of fact, Arik Airline has been in a precarious situation largely attributable to its heavy financial debt burden, bad corporate governance, erratic operational challenges and other issues, that required immediate intervention in order to guarantee the continued survival of the Airline. Yesterday, Arik temporarily suspended its flight operations to the John F. Kennedy International Airport, New York, United States, claiming that the two Airbus A330-200 aircraft dedicated to the route have been taken to France for C check at the same time. Equally more than eight aircrafts are currently grounded at the tarmac making it difficult to meet their routine commercial flights. The myriad of issues confronting Arik Air of late ranges from confiscation of aircrafts due to non-payment of leases, frequent flight delays, constant fracas between Arik Staff and irate passengers at both local and international airports etc. During the last yuletide season, passengers were stranded in airports all over the country due to Arik’s incessant flight delays and cancellations, which negatively affected the preference they enjoy from passengers. You are all living examples of this. The airline is so overwhelmed to the extent that the worker’s wages are not paid for several months, leading to occasional confrontation between the management of Arik and different Aviation Unions in the country. It was Arik’s inability to pay its workers for seven months that forced the United Labour Congress (ULC) and Engineers Union to recently shut the offices of the Airline across the country causing untold hardship to thousands of travelers and an embarrassment to the aviation sector in the country. Besides owing workers’ salaries, the Airline has also not been remitting the taxes of workers to relevant bodies thus also defrauding the country. The Airline is also in perpetual default in its lease payments and insurance premium, leading to regular and embarrassing repossession of its aircrafts by Lessors. We assure all stakeholders that the intervention is in the best interest of the general public, workers, creditors and other aviation interest groups.